What a difference a couple of weeks can make to your potatoes. A wet spell followed by a few days of heat and things have doubled in size. 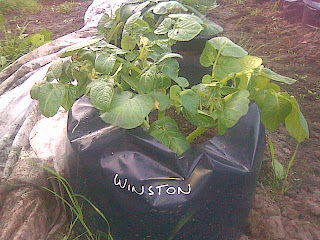 My exhibition potatoes are doing well in their 17 litre polypots. They were just starting to dry out so I had to water them last week just to keep them ticking over. 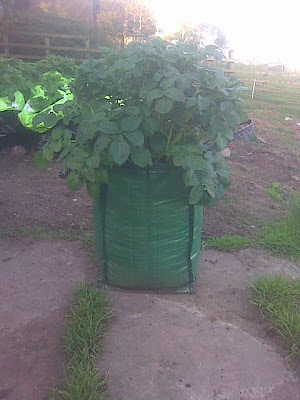 The potatoes in the compost bags are doing really well and they tend to retain more moisture in the bigger bags. 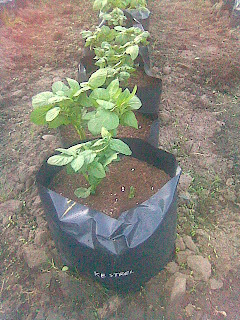 Best of all though are the ones in the potato planter bags. 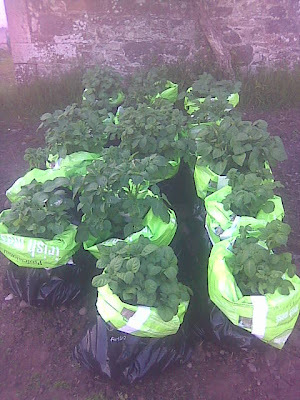 They are steaming ahead of anything else and I think the increased ventilation all the way around the bag is certainly helping growth. 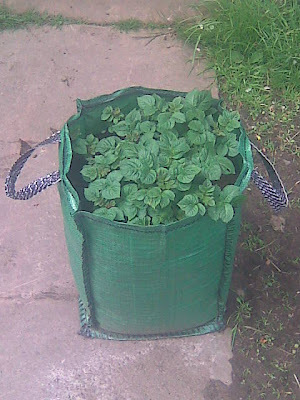 As an experiment I have now planted 3 Swift, 3 Rocket and 3 Charlotte in the potato planter bags to compare the crop size of the bags that contain 5 seed potatoes. 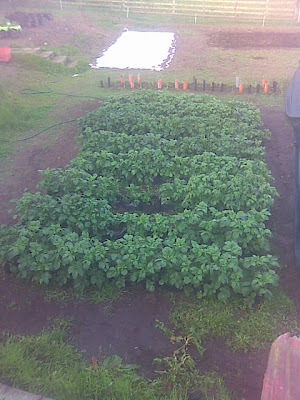 Here is how well the 5 potatoes i planted in a potato planter have got on last week and this week. I have only topped the bag up twice. I think the secret is to only water once when the shoots pop through and then add 6" of dry compost on top. 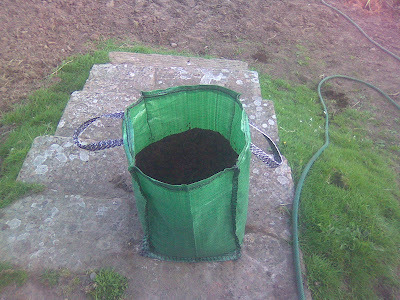 When the shoots appear again add more water and top up with dry compost. 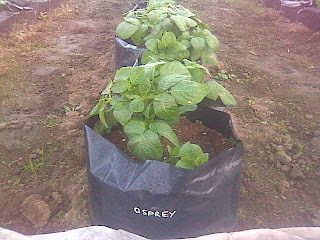 Here is an update on the potatoes that I planted in polypots for exhibition use this year. 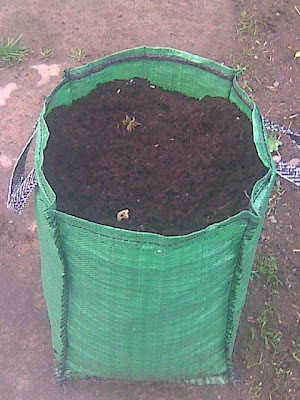 They have grown really fast and now the roots are established into the ground through the holes in the bottom of the bag. 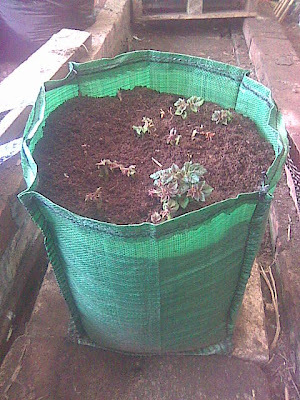 A simple and effective system of growing potatoes. Yet more good news for us here at Jamieson Brothers as world champion exhibition potato grower is now using our highest quality seed potatoes. We would like to wish the Plumb family all the best in their bid for success on the showbench this year. Labels: Sherie plumb world champion exhibition potato grower. Well yet more rain today has stopped planting but we will be back out next week and soon make up for lost time. 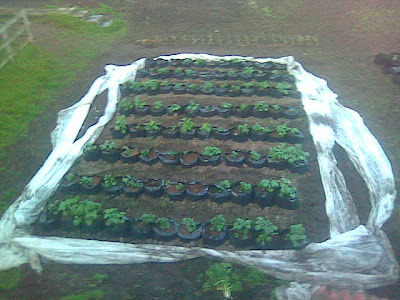 It is immpossible to plant potatoes in the rain as all the soil sticks to the machines and does not make a proper bed for the potatoes. Compaction is also another problem with working on wet ground.